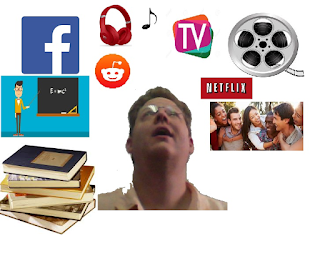 TV/movies, music, news, friends, parents, extended family, books, radio/podcasts, webpages you read, facebook(social media), teachers, coworkers, and the rules of your groups/organizations. So I imagined this up. So many sources of information. I wondered how much time I spent letting each source of information speak into my life each day. How much of my story did I allow them to become? I decided which items were more lies than truth in my life. But then I wondered,... how much time in each day do I let the lies in? Now... Facebook isn't all lies, and not all books are truth. So that made things more difficult. Which is where my program idea came in. So I wrote a program, and I got the help of my son to do the math on it... that basically asked 28 questions. On a scale of 1-5 (5 being very frequent) how much time in an average day do you spend enjoying_____(music/facebook/etc) :? And once you answered those questions, the program would tell you exactly how many lies you were allowing into your head each day, and what percentage of truth you were engaging with each day. At the same time, I began watching a video explaining the difference in culture between Millenials and Gen X (me). When we got to the point of the idea that there is no absolute truth, that your experience is what dictates decisions... I thought about that. See.... it's really not that far from what Gen X believes, though our generation likes to pretend we're very very different. The truth is, if you're a Gen X'er, and you believe in absolute truth, and your personal experience contradicts that absolute truth, you're perfectly okay believing contradictory things. It's a hallmark of our generation. So... in that respect our experience does in fact have a lot of weight. Regardless, I realized asking the question 'how much truth do you feel Facebook has to offer you?' while allowing you to respond with whatever your views on the relativitity of truth is... and therefore allow for multiple cultural perspectives... maybe much harder for a millenial to answer. Why oh WHY did I have to get education in the middle of writing this program? I mean, wouldn't you answer 'DEPENDS?' to that question? But then answer it yourself based on what it depended on? The bottom line is... I wanted to create a visual representation to make people aware of this. 1 - The Devil seeks to kill you, steal from you and destroy you. 2 - His chief tactics involve lieing to you so completely you begin to think it is true. 3 - You can most easily detect a lie when you spend a lot of time in the truth. 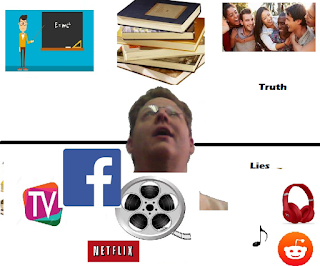 4 - Therefore you should determine what your sources of truth are, and enhance your time with those, while decreasing your time surrounded by lies. For me, my profound source of truth is reading the Bible. But not just reading it. Reading it, understanding it, thinking about it all day, and applying what I read that day to at least 1 moment of my day... making it real, applying it. Not just theory but doing it. That is the most profound source of truth. Other sources of truth are good, wise, godly people, who speak truth to me in love and hold me accountable. (this includes friends, co-workers, family, teachers, etc). But I don't blindly trust all books, nor do I blindly trust all people. Only people who all agree on the basics. Well, the last few books of the Bible really boils it down for us. 1,2,3 John and Jude ALL warn us heavily against false teachings. HRM... why do you think that was some of the final words in the Bible? Maybe because God knew that we'd be surrounded by lies everywhere we turn? LIES EVERYWHERE! Layers of lies upon lies such that if you see through the first layer, you may still believe the lie of the second layer, because the enemy has been building this onion of lies for so long it's so hard to see truth. It's exhausting to fight constantly, but we have to. Because he is. -anyone who does not profess that Jesus Christ is the son of God is a false teacher. -tolerance always unless you come across someone intolerant, and then you do not need to tolerate them. -love everyone, but do not allow false teachers to be among you, cast them out of your churches and homes. We need to diminish the lies we allow into our lives... and enhance the amount of truth.. Change your personal formula.